One boring Sunday morning, I was planning to go out to buy some kitchen stuff. I got ready and before I went out, hubby already took out the inflatable pool and began storing water. The kids were so excited and cant wait to splash into it. While its still half full, the kids were already inside. I know the boys missed swimming a lot. 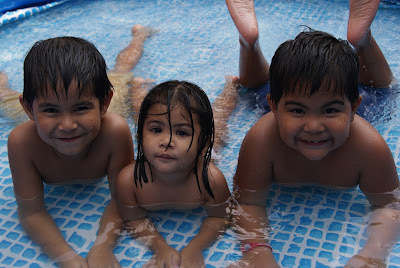 They used to swim everyday as we have rented a house in Ayala Alabang with swimming pool. So when we moved to this new village in the South, we purchased an inflatable pool. I must admit I am not a water person so much. Not that I dont take a bath but I just dont like swimming. I had a bad experience when I was young. 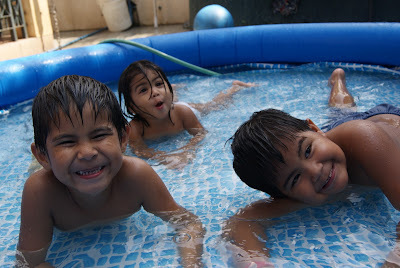 But my kids and hubby like swimming a lot. So every time we go to the beach or in the pool, I am always the mommytographer! looks like they really enjoying! cute kiddos you have! I wanted to bite them!They are very cute!Congratulations!